Attic remodeling can be a complex process, requiring a skilled team of contractors to ensure professional-looking, lasting results. Kuhn Construction has more than three decades of experience helping homeowners in Islip and Suffolk & Nassau County with their attic renovations. Our designers will be happy to work with you to develop a plan for your attic space that suits your needs, blends naturally with the rest of your home, and fits comfortably in your budget. Our highly skilled technicians are fully licensed and insured, and also well trained to ensure that they can complete all their home remodeling work with exceptional craftsmanship. We stand behind the quality of our attic remodeling work with a lifetime, written warranty covering all parts and labor. We’re also committed to giving our customers the best value for their money, so we’ll beat any offer from a comparable design / build firm by $100 and work to find you qualified financing options that fit your budget. 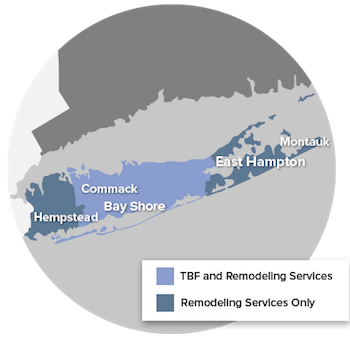 To learn more about our attic renovation solutions for homeowners in Suffolk & Nassau County, contact us today to schedule your free design consultation and estimate. You can also find out about our other solutions, including bathroom remodeling, kitchen remodeling, basement remodeling and finishing, home additions, and more.